I just don’t understand how this works. The days (specifically while at work) seem to be 65 hours long but then all I have to do is blink and it’s been a week. It’s not just me, right? This craziness happens to everyone, doesn’t it? I’m worthless on Thursday nights. Community, The Office, and 30 Rock have drawn me in and I can’t bring myself to ignore them. I don’t really mind though because it’s probably the most I laugh all week. And since laughing is good for the soul, I think our evening on the couch with dinner and NBC is an investment in my health. Don’t tell me otherwise. 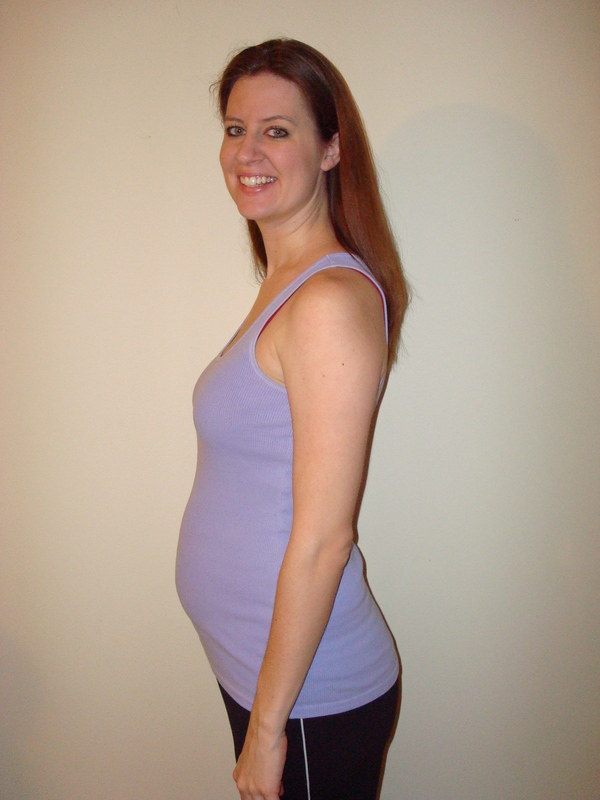 I’m currently sitting on my couch, typing on my laptop, wearing a pre-pregnancy exercise top with a built in bra. Why am I telling you this? Because my belly is hanging out LIKE WHOA and I look seriously white trash. And these are the kinds of things I share with you. We need to talk about this new KFC Double Down Chicken Sandwich. Is this for real??? Bacon and cheese between two fried chicken breasts? What is our world coming too? It’s almost as bad as Suri Cruise in stilettos or over the counter paternity tests. 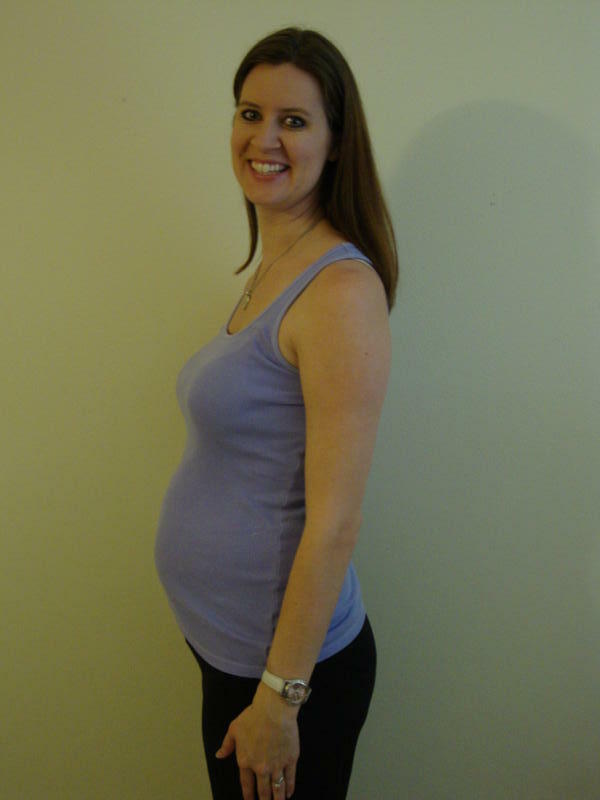 And just for visual proof, here is a picture of me at 15 weeks and 19 weeks. Anyone have any really good recipes that involve strawberries? I anticipate coming home from strawberry picking with an abundance of berries. I don’t want any of this sterilize, boil, all-day-in-the-kitchen jam business. No thank you. I may try some freezer jam. Anything else? While I was in the waiting room yesterday at the doctor, there was a girl there with her mom. She looked to be about 15. She was skinny and her makeup was too dark for her face and she was wearing PJ pants. She kept talking to her mom in a really soft voice using words about five times faster than the average human. At one point I saw her mom look at the pregnant girl to the left of me and say, “Yeah but look what she has on her hand. See that? You need that first.” Then she turned to me, “Her too. Look at her hand.” I had no clue what they were saying but now that I was involved, I looked at them. Momma explains, “She said that y’all’s baby bumps are so cute that it makes her want one. I told her to look it your hand. She needs a ring before she has a bump.” It took ALL MY POWER to not stand up and pull that girl up by her messy bun and tell her to enjoy being a kid, close her legs, and FOR THE LOVE OF PETE do not get pregnant. This girl was also in an argument with her mom over something that I’m sure was really important. She kept saying things like, “How could you take his side over mine? You’ve known me your whole life! You’ve known him two years.” “Three years. I’ve known him three years. We’ve been married two years. And I’m not taking sides.” “Yes you are. I’m your daughter. You’re supposed to be on my side!” Umm no, honey child. She is supposed to be on her husband’s side. And I’m pretty sure I’m on her husband’s side even though I don’t have any idea who her husband is. What in the world am I going to do if this child is a girl? Can she live with one of y’all from age 13-18? This week was Shania Twain week on American Idol. Two things that are very wrong with this world. I’m certain I would have vomited if I had turned it on. And that’s all I’ve got for you today! I hope everyone has fun weekends planned! I’m praying that it quits raining tomorrow so nothing messes with our berry plans!